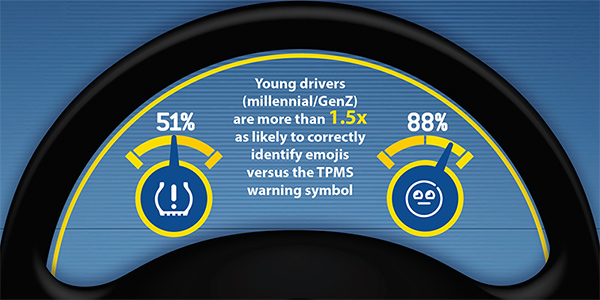 Younger drivers (millennial/Gen Z) are more than 1.5 times more likely to identify popular emojis correctly than the tire pressure monitoring system (TPMS) warning symbol, a new study commissioned by Goodyear Auto Service and Just Tires reveals. In fact, 49% of younger drivers and 39% of overall drivers were unable to recognize the TPMS warning symbol in a survey of more than 1,000 U.S. drivers. The survey also found that 88% of younger drivers correctly identified the eye-roll emoji, while 51% recognized the TPMS warning symbol. The lack of awareness of the TPMS symbol, an electronic system designed to monitor the air pressure of a vehicle’s tires, is a clear sign that some drivers are in the dark on what the light means and what to do when it’s triggered, Goodyear said in a press release. Goodyear Auto Service and Just Tires want to be the destination to clear up confusion for customers by offering drivers free tire care checks, including free tire, air pressure and TPMS inspections. The study also found that most drivers surveyed are not taking precautionary actions to prepare their cars for winter. Among drivers who live in areas with usually cold winters, less than half (42%) get their tires checked in advance of the winter season. And almost two in five winter drivers (37%) do not take any action at all to prepare their cars for winter unless they have an issue. As a general rule of thumb, drivers should check their tires monthly, especially during temperature shifts of 10 degrees or more. From now until the end of January, customers can save $75 on tire installation with their purchase of four new Goodyear or Dunlop tires at Goodyear Auto Service and Just Tires locations.